If you are planning to start your own website or blog then you have to register a domain name. And one of the most important things is choosing the right web hosting provider to host it.Doteasy is the best web solution for you. 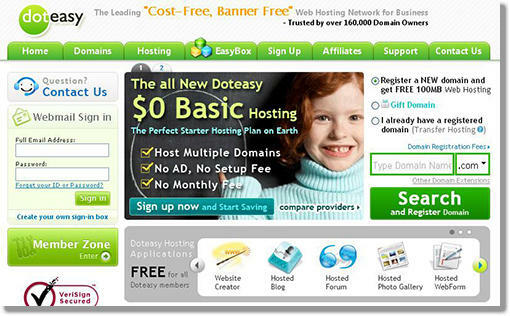 DotEasy free web hosting is a provider, that’s mean you can host your blog or website for free.They are the leading cost-free, banner-free business hosting network that does NOT place annoying banners on members’ web pages. There are many online sites out there offering free web hosting.And they will place their banners or ads on the web pages later. But Doteasy is different from them and they are offering banner free web hosting.As they are in the web hosting business from last 10 years and boosts a 99.9% uptime. Host up to 10 Add-on Domains. Doteasy gives you 3 different hosting plans to choose from, which range from Basic (free) to Unlimited Hosting ($9.95 per month), with two additional Windows Hosting Plans targeting ASP and MsSQL needs. Using this 1003BPM coupon code Basic package, the domain registration for .COM/.NET/.ORG domain is just for $7.95 with one year of free web hosting. You can already register a .com, .net, .org for a very cheap price, plus get a free hosting package included. Just use the coupon code 1003BPM to join and sign up for free web hosting through this promo. Previous: Indian SEO Community Brings Learning With Earning Offer.